Send the sweet person in your life this sweet bouquet. 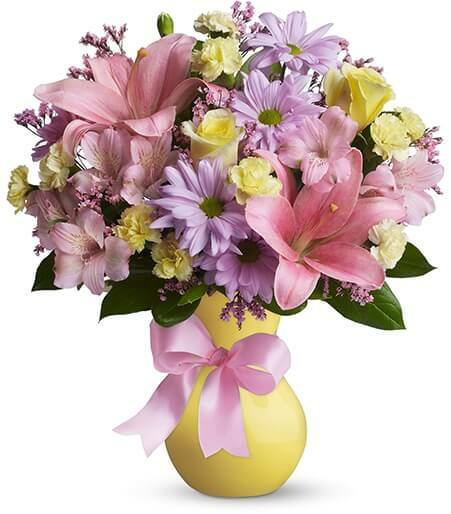 Soft colors, beautiful flowers in a yellow vase that's wrapped in a pretty pink satin bow. Simple? You bet. Special? For sure! Bright yellow roses, pink asiatic lilies and alstroemeria, light yellow miniature carnations, lavender daisy spray chrysanthemums and pink limonium are gorgeously arranged in a pretty yellow vase, complete with a satin bow. Sweeter than sweet! Vase may vary.